Something is always happening at the region’s newest and most innovative event venue with a growing calendar of concerts, conventions, sporting events, trade shows, and conferences. The Arena also excels at banquets and social events with flexible floor plans and in-house food & beverage service catering to every taste and budget. 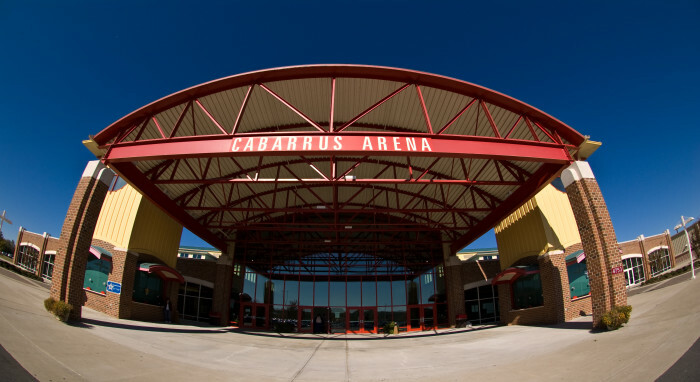 Visitors to the area should check out the Cabarrus Arena’s website calendar before they make plans. Subscribe to the Insider Club and receive weekly e-newsletters listing upcoming events. In addition, subscribers get pre-sale passwords to purchase tickets before they go on sale to the public, discount ticket opportunities and codes and contests to WIN tickets. RV camping is also available on property…water, electricity, and sewer connections. The Arena provides 2,300 fixed seats with additional seating available on the arena floor to accommodate up to 6,000 persons and 7 VIP suites seating 12 persons each. Like-New facility. This versatile Arena hosts events ranging from concerts to consumer shows. Adjacent events center, multipurpose rooms and meeting/banquet rooms.